Yesterday on Wallbuilders Live, David Barton doubled down on his claim that parts of aborted fetuses are in vaccines. He made that claim last week and after I wrote to refute it, he devoted a whole show to the topic today. His guest for the program was anti-vax biologist Theresa Deisher. Deisher has a PhD in microbiology from Stanford and at one time was a mainstream scientist. Several years ago, she converted to anti-vax ideology and has focused on the theory that vaccines cause autism via the introduction of fetal DNA into a vaccinated child. The most shocking false claim that the Barton’s (father and son) make on the program is that body parts are taken from live babies for use in vaccines in use today. 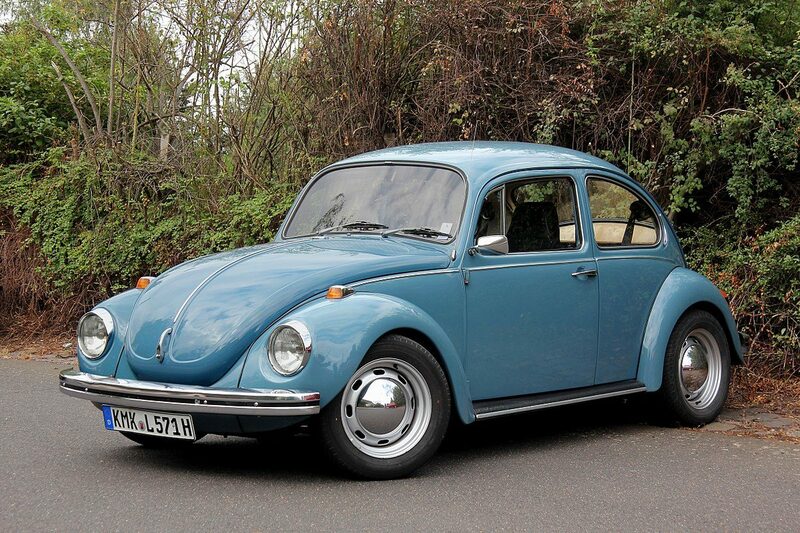 This of course would be illegal. Despite what Barton and Deisher say, there is no legal process where children who are alive can be dismembered in this manner. Of course, anyone would be opposed to that. Federal law (Born-Alive Infants Protection Act of 2002) protects infants who survive abortion. Any baby who survives an abortion must be treated as a live person. I don’t know that this law is always followed but it is the law. Deisher nor Barton offered any proof that babies are being killed in this manner. Dr. Deisher’s work has been thoroughly debunked. Participants: 657,461 children born in Denmark from 1999 through 31 December 2010, with follow-up from 1 year of age and through 31 August 2013. Results: During 5,025,754 person-years of follow-up, 6517 children were diagnosed with autism (incidence rate, 129.7 per 100 000 person-years). Comparing MMR-vaccinated with MMR-unvaccinated children yielded a fully adjusted autism hazard ratio of 0.93 (95% CI, 0.85 to 1.02). Similarly, no increased risk for autism after MMR vaccination was consistently observed in subgroups of children defined according to sibling history of autism, autism risk factors (based on a disease risk score) or other childhood vaccinations, or during specified time periods after vaccination. Barton has moved into dangerous territory here. He is trying to scare people away from vaccines with these false claims and as a result may be partly responsible for people deciding not to immunize their children. I would not want that on my conscience. 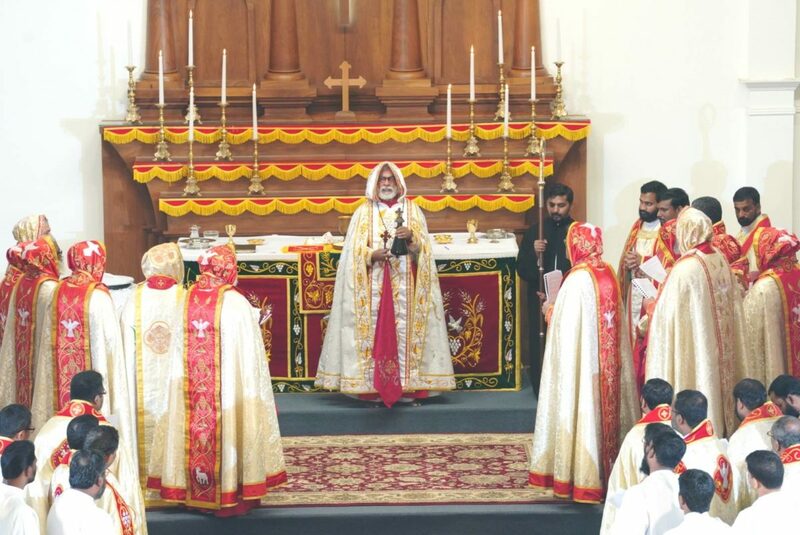 Even the Catholic Church advises members that they may use vaccines due to the greater good of preventing sickness and death. 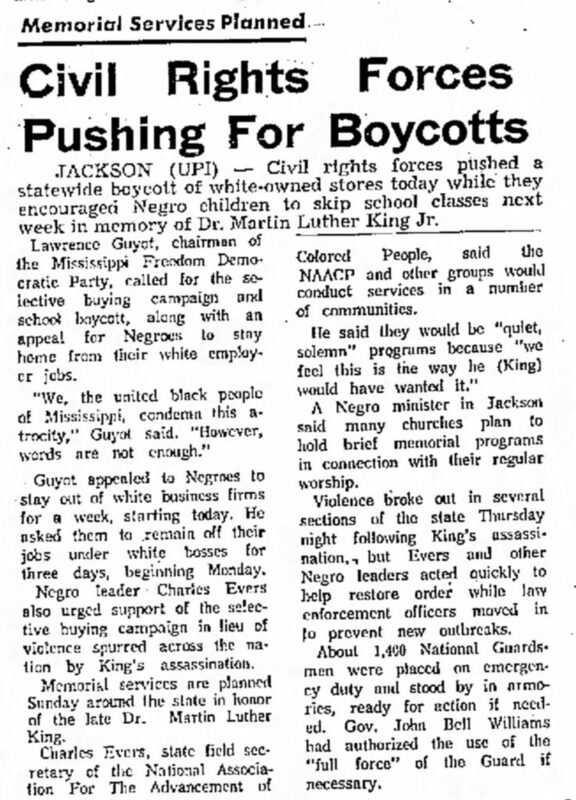 Where Was Charles Evers After Martin Luther King, Jr Was Murdered? At 6:01pm on April 4, 1968, Martin Luther King, Jr. was murdered in Memphis, TN at the Lorraine Motel. Recently, I posted a statement from the John and Vera Mae Perkins Foundation regarding the night of Martin Luther King Jr’s murder. Since 2007, John MacArthur has publicly stated that he traveled from Jackson, MS to Memphis, TN the night MLK was murdered. His stories strongly imply that his companions on that trip were civil rights icons John Perkins and Charles Evers, as well as other unnamed African-American people. Charles Evers has denied this and the Perkins Foundation’s representative told me that Evers’ statement is accurate. At the same time, the representative (John Perkins’ daughter Deborah) declined to make any statement about her father’s travels on that night. Charles Evers has told at least three different stories about that night. He has said he was on his way to Natchez for a meeting and heard on a car phone that King was killed. He also said he heard it on the radio while in the car. He said on one occasion that he was with Bobby Kennedy in Gary, IN when he heard about the murder. However, he never said he was with John MacArthur in Jackson, MS when he heard the news. He told me when I interviewed him that he may have gone later to Memphis but not on the night of the murder. In his various accounts, Evers said that he returned to Jackson after he heard the news and denies going to Memphis. This much can be confirmed. Some specifics might be lost to time but we can place Evers in Jackson after the murder according to newspaper accounts. 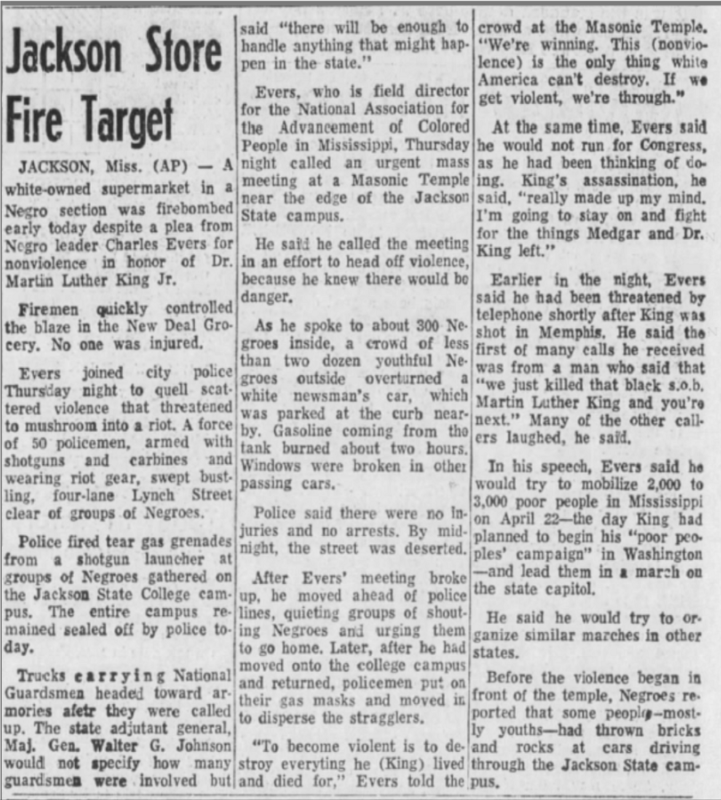 In this April 5, 1968 Greenwood (MS) Commonweatlth news article, it is clear that Evers is in Jackson helping to quell violence until late in the evening of April 4 (this article helps establish the time). While he could have gone to Memphis in the small hours of April 5th, it appears that Evers remained in Jackson on the evening of April 4. 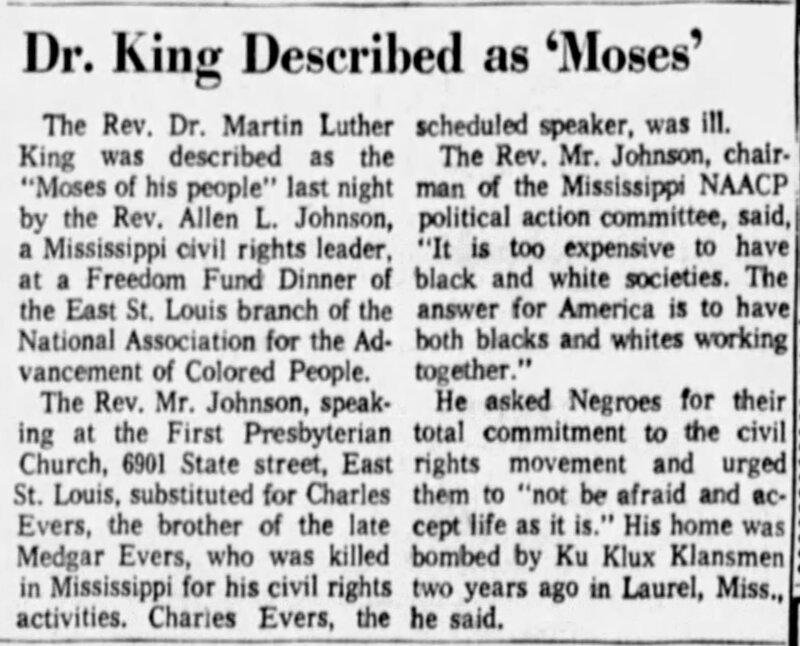 According to a short piece in a St Louis daily, Evers was supposed to speak at a NAACP event in St. Louis on Friday night April 5th. However, he didn’t make it due to illness. 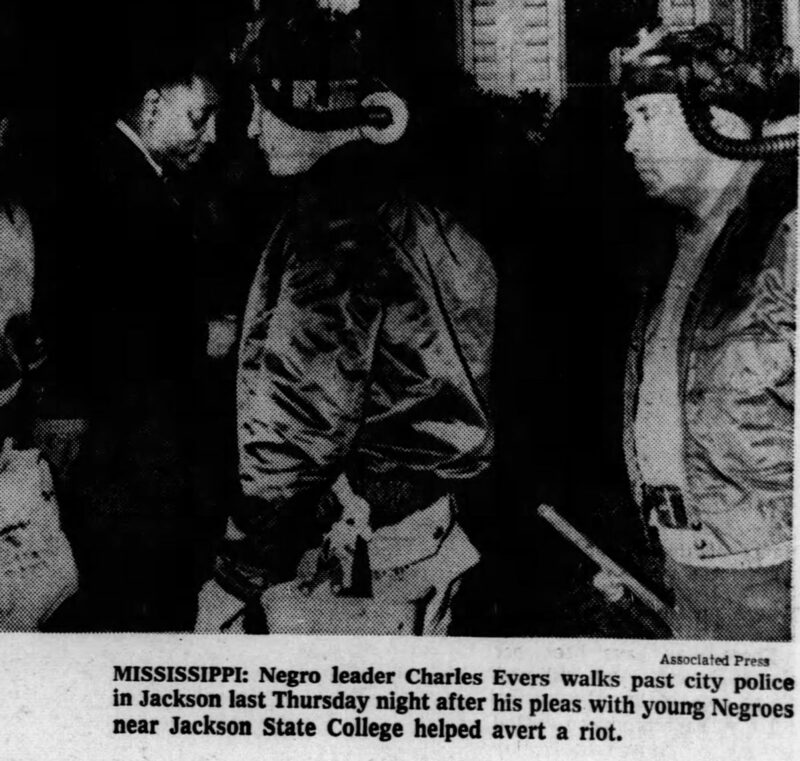 While it isn’t certain that Evers was in Jackson, the location of this UPI article is listed as Jackson. The interview would have taken place on Saturday April 6. In this April 8, 1968 news article a photo was published of Evers with Mrs. King at the funeral which took place on April 7 in Atlanta. None of these clippings conclusively disprove John MacArthur’s story. 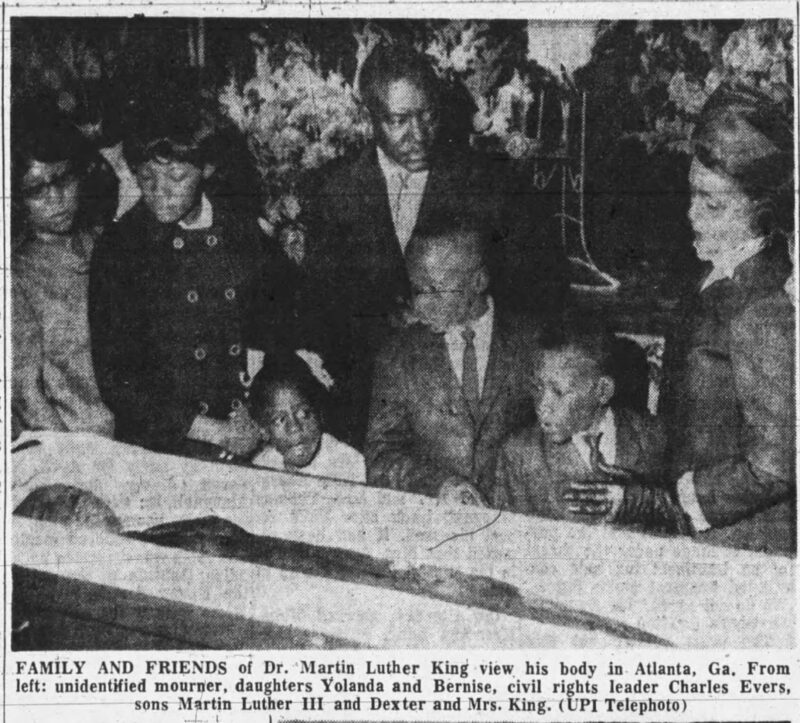 Taken together, they do provide evidence that Charles Evers was probably in Jackson from the time he heard about the death of King until he went to King’s funeral. 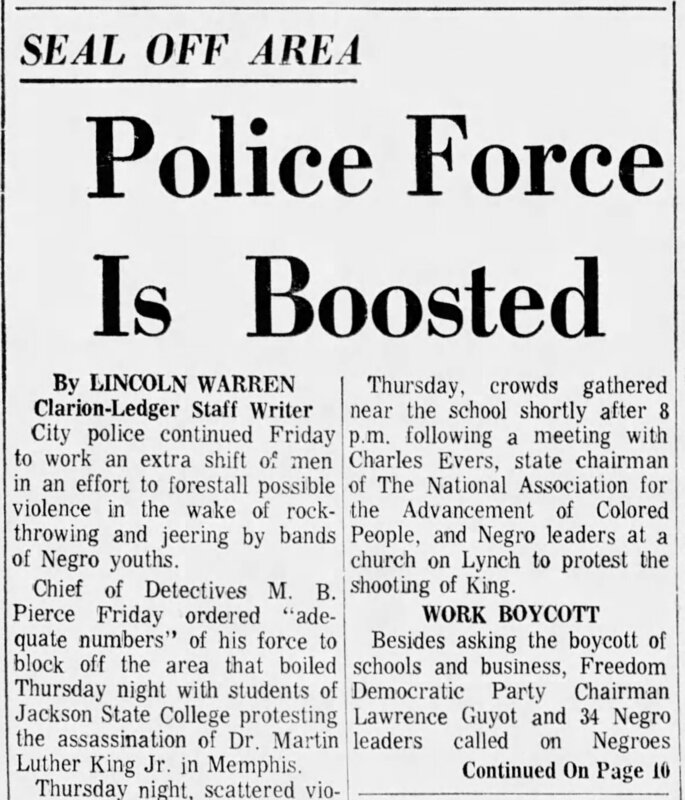 Author Warren ThrockmortonPosted on April 4, 2019 April 4, 2019 Categories John MacArthurTags Martin Luther King JrLeave a comment on Where Was Charles Evers After Martin Luther King, Jr Was Murdered? Founder of Wallbuilders and GOP operative David Barton is slated to speak at a Lincoln Day Dinner in Idaho Falls, ID on April 13. 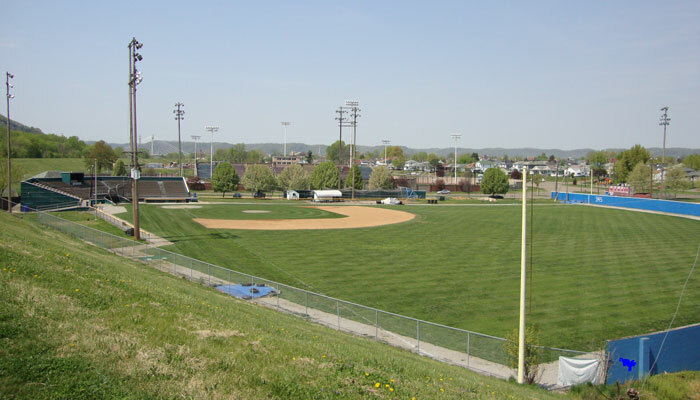 Some local officials aren’t very happy about it. To protest Barton’s visit, Idaho Falls City Councilman John Radford and Bonneville County Democrats Committee Chairwoman Miranda Marquit have organized a community rally focusing on inclusion. 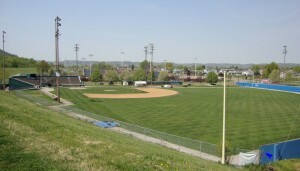 The group plans to meet on the same day at a nearby park. 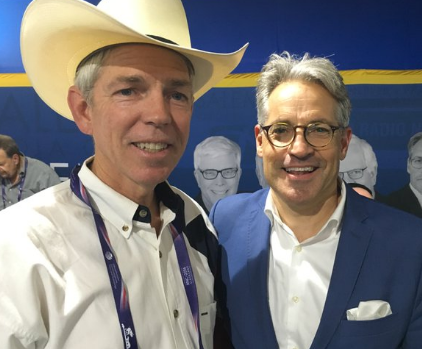 Unfortunately, David Barton has been invited to share his brand of exclusion and “wall building” with our community. We’d like to host an event where we discuss the beauty and strength inclusion can bring to our community. we want to present An alternative to the David Barton approach, which focuses on exclusion and exceptionalism around race, religion, and sexuality. On the Facebook page, a link to a NPR article on Barton’s distorted history can be found and the news article mentions Barton’s book The Jefferson Lies which was pulled from publication due to historical errors. In today’s GOP, pretending to have an earned doctorate, being an anti-vaxxer, denying climate change and distorting history isn’t a big problem. However, it is good to see others make the public aware of these issues and challenge Barton’s claim to be an expert.